Unlike some agencies and networks, The Copywriters are solely interested in quality and producing content that works. Some companies act as portals aiming to find the cheapest possible prices. As we all know, you get what you pay for! Many of the companies we work with on the publishing side are based in Europe with a reasonable grasp of English. But, as any good quality copywriter knows, copy needs to be perfectly structured. The right words equate to results and the wrong words in the wrong order are next to useless. We are not aiming to be the cheapest, our goal is to be acknowledged as the best. We aim to be the first port of call for those wanting to engage an experienced team whose primary goal is to make the clients’ business better. What do people working with The Copywriters get? This is probably the first question anyone reading this would be asking. We’re not going to shy behind a cloak and hide anything. We offer a very generous split of the total fee charged. If you write for an existing copywriting company, you’ll know that your share is comparatively small when compared to what the company is paid. We aim to change this. In some cases, copywriters working with us get the same as we do. 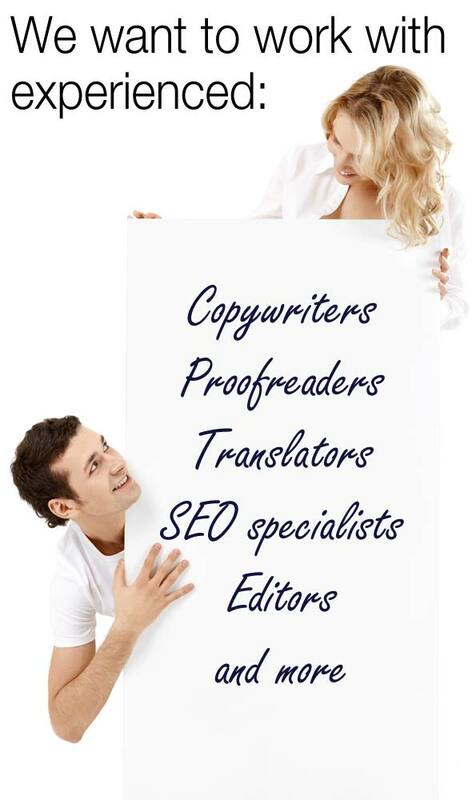 When we work with freelance copywriters, our role is to provide the business enquiry, support you and manage the contract from start to finish. We want to work with individuals with a proven track record whether this is as a writer, interpreter or proofreader etc. We would request examples of your work and proof of your experience. Qualifications and awards would obviously be advantageous. We will consider experienced people outside of the UK as many of the companies we work with are based overseas. We have a standard agreement you will be required to sign. This agreement covers us for general liability and any other factors. As you will be under contract with The Copywriters, if you work with a client introduced by us and they contact you directly for more work. You will be obliged to undertake this work via The Copywriters or you will be in breach of contract. This only applies for 12 months from the introduction of the client. Often, to achieve the right results, a strong first-hand understanding of the clients business or services is required. To gain this, a good copywriter will need to visit the client to understand their goals, values and USPs. If this is requested, we will always try to incorporate this element into the quotation. However, this is not always possible and to remain competitive, if no budget is available from the client, you will need to absorb the cost of this. Our standard payment terms are 14 days, but some larger companies could take longer. This will be discussed with you without any insistence. We will request an invoice from you and we will then invoice the client. You will be paid once we receive the money. If you have a question, please do not hesitate to contact us on 0207 193 8380.